Cháo, or rice congee, is synonymous to me with cold remedies. As a child, this Vietnamese soup was Maman's antidote; the warmth is soothing for the throat and the soft texture makes it easy to consume. 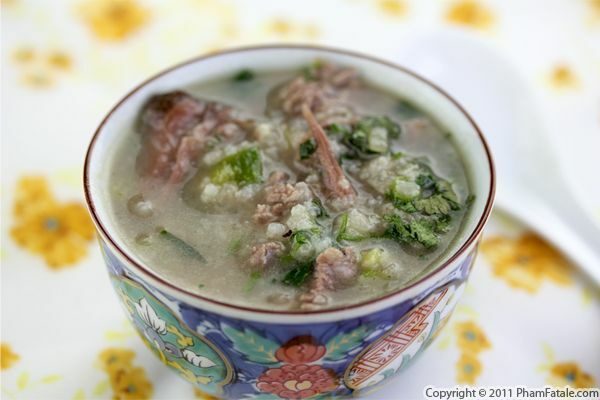 The soup contains a handful of rice which acts as a thickener for the flavorful broth. Today, I made my favorite version: it's called cháo thịt bò, "beef rice soup" in Vietnamese. I made my usual beef broth in the same manner as I would to prepare phở bò. I added oxtail bones, ginger and onions. My trick for never messing up this recipe is to cook the rice in small portions. I cook 3 cups of broth for a few tablespoons of rice. You’ll get a much better product if you prepare it in small batches. As soon as the rice thickens the beef broth, I add paper-thin slices of flank steak at the last minute along with fresh ginger and freshly cracked pepper. With Thanksgiving just around the corner, I’m sure many of you have turkey on the brain. For those of you who don’t really much care for turkey meat, here’s a steak recipe that still manages to capture some of the flavors of the season. Specifically, I made a cranberry-flavored cream cheese that I stuffed into the steaks. I was inspired by a chicken recipe I recently made with a filling of Granny Smith apples. The only difference is beef doesn't need to marinate overnight. 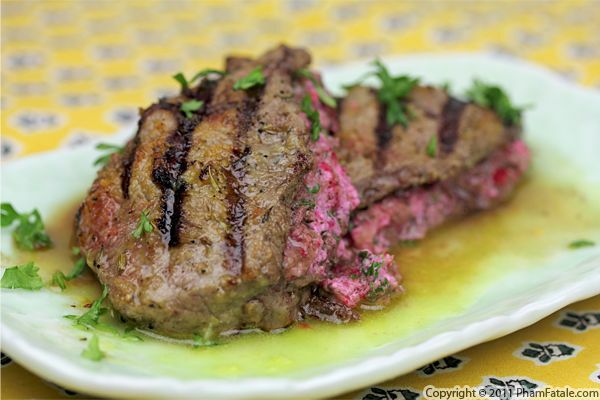 Allow beef to marinate for at least 15 minutes, but no more than 30 minutes. I used my usual meat tenderizer (green papaya paste). After stuffing the steaks with cranberry cheese filling, I sealed them with twine. I gave them a quick searing and then transferred the steaks to the oven to bring them to a perfect medium-rare. The cranberries bring a hint of tartness to the beef in addition to fitting perfectly on your (non-traditional) Thanksgiving table. Bún thịt bò xào xả ớt (chile lemongrass beef noodles) is one of my favorite Vietnamese "casual" everyday meals. I like the way lemongrass is used to spice things up in this Vietnamese classic. Tender, boneless stir-fried beef is cooked with fresh lemongrass, freshly chopped chile peppers and onions. 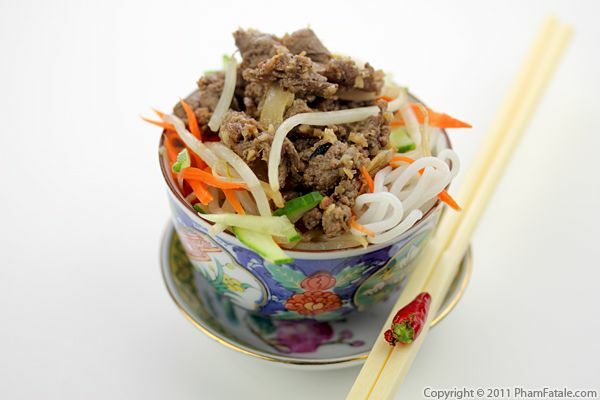 The meat is served in a bowl filled with cold vermicelli rice noodles, roasted peanuts, fresh vegetables (usually cucumber and pickled carrots), fresh Vietnamese herbs and soy bean sprouts. The entire dish is drizzled with mixed herbed fish sauce as seasoning. The cooking time is very fast, and call me crazy but I love the sound of the sizzling pan. I stir-fried the beef, but on hotter days, you could also thread the meat into skewers and grill them. Note: Glossary of relevant Vietnamese cooking terms. Today I tested a rolled stuffed steak recipe for my Labor Day menu. I grilled the steak on the barbecue. First, I made a red olive tapenade and used it as the spread for the steaks. I selected boneless beef round as it's a leaner cut of meat. The marinade I prepared served both as the meat tenderizer and the sauce. It was a simple mix of olive oil and lemon juice. I used California Olive Ranch olive oil, which I just received in the mail. 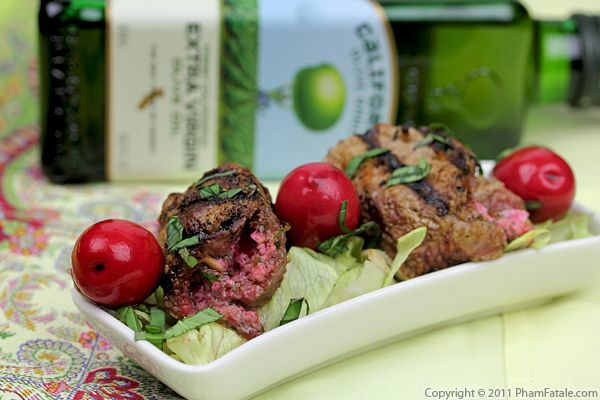 The extra virgin olive oil is fragrant with bold, fruity notes. It imparted a very distinct and pleasant flavor to the beef, and I would definitely use it again. I enjoyed the olive oil so much that I asked Kirsten from California Olive Ranch if we could give away a bottle to Pham Fatale readers. Kirsten very kindly agreed, and has generously offered not one, but three bottles! We’re planning on selecting three winners at random this week, with the first giveaway starting today. For a chance to win the first bottle, all you need to do is complete the form below the description. It should take about 30 seconds. Please use a VALID email address because this is how we will contact you if you win! The 30th of August is the deadline; any entries after that date will be not qualify for the giveaway. I will randomly pick the first winner and announce the name on Wednesday, August 31st. And for those of you who can't wait to try California Olive Ranch olive oil, head over to their online store, enter coupon code BLOGFRIENDS, and enjoy a 10% discount (for Pham Fatale readers)! Pham Fatale Giveaway Terms and Conditions: No purchase necessary. All prizes are generously donated by the company featured. Pham Fatale does not accept money or gifts in exchange for these items. The companies featured in Pham Fatale Giveaways did not pay to participate in the Giveaways. Winners will be chosen at random, and odds of winning depend on the number of entrants. Pham Fatale is not responsible for late, lost, stolen, illegible or incomplete entries which will be disqualified. Pham Fatale will not give your information to the prize-giving company for future marketing. US Residents only please. Only one entry per person per giveaway. Prizes are not refundable or returnable. Giveaway terms subject to change. I'm a huge fan of fall-off the bone, super tender beef ribs. My trick is to marinate them overnight with (I used an Asian pear purée and ground papaya mixture) to tenderize the meat. 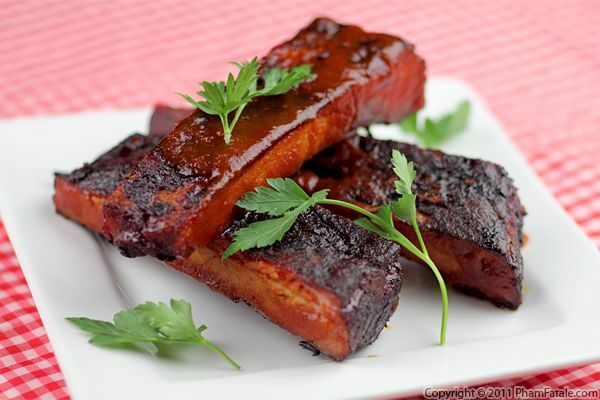 The following day, I cooked them, wrapped in aluminum foil, for several hours in a slow cooker. Lastly, I smothered them in barbecue sauce and place them on a barbecue grill. July 4th isn't the same without beef ribs. I don't make them that often because I find it quite time-consuming and the result is pretty meager for the amount of work. What I mean by that is that there is very little meat falling off the bone. What can I say, I'm very greedy when it comes to eating meat! Purists will probably think it's wrong to par-boil or steam the ribs in a slow cooker because flavors are lost. But the slow cooker method guarantees that they turn out very tender. Page 6 of 15 pages.